As the sun was setting on Saturday, the hills of salt outside the run-down factory buildings at Lumen 2012 looked otherworldly. The one-night video and performance art festival was staged in the vacant spaces of the old Atlantic Salt Company on Staten Island, where 150,000 tons of salt that had gone unused during the curiously warm winter were transformed into performance pedestals and projection sites. This year’s Lumen was curated by Christopher Eamon with performances in collaboration with Grace Exhibition Space and the Council on the Arts & Humanities for Staten Island. Over 50 artists participated. This was the third year for the festival (last year’s edition took place at the National Lighthouse Museum on Staten Island), and it was overall a wonderfully transporting experience, with the dreamlike tone enhanced by various industrial ships and tugboats passing silently by in the Kill Van Kull waterway, as well as the fireworks that suddenly sprouted from the harbor, which turned out to be the 100-year anniversary celebration of the Girl Scouts of New Jersey. I seemed to lose track of time wandering from one piece to the next, suddenly finding a performer clawing through a pile of salt or a strange cyclone of steam rising from an installation by Steve Jones. There were a few missteps, like the placement of sponsorship ads right in the middle of some video art over the main entrance tunnel and the performance artist who screamed “I’m fine!” over and over again in front of the portable toilets. However, it was mostly a cohesive experience that felt different from any art festival I’ve experienced in New York. The mounds of salt made for a striking backdrop, especially when surrounded by a quiet industrial waterfront where some of the derelict buildings date back to the 1800s. This “Salt Garden” was where a variety of performance artists staged spectacles, including Alien Moon Partnership. In that piece, a man dressed in women’s clothing poured blue-tinted water on his face as tears representing “a failed expression of masculinity.” His form was haunting in the sunset. In addition to making any performance visually beautiful, the salt landscape also led to some interesting acts of movement, whether it was walking up and down a hill and letting the salt fall in cascades or, in the case of Maia Dolphin-Krute and Bradley Tsalyuk, lifting handfuls of salt over a tower and letting it slip between their fingers. In that vein, most of the performance art was kinetic, except for Rob Andrews, who stood precariously still while coated in a ghostly layer of salt, claiming a solemn tranquility over one space of the festival. John Bonafede was tirelessly creating a painting collaboration between him on the bicycle and the audience, and while this was less a direct interaction with the salt than some of the other performances, the shadows cast on the white grains behind him became more dramatic as the sun receded. One of the video pieces to most creatively incorporate the salt while also being an independent work was Brendan Coyle’s “a sad duck boy called Mr. Canard,” in which a “saltwater duck that has lost his heart” cries so profusely that he becomes cocooned by salt, after which he emerges and “excretes a saline substance through his beak that crystallizes into a beautiful diamond, which he believes to be his new heart.” The video played on an orb mounted in the salt pile, as if the bird was in fact trapped inside. Right next to the poor, weeping bird was Marco Brambilla’s “Sea of Tranquility,” which projected a scene of the decay of a lunar module left behind on the moon, not unlike the ruins of the factory left behind by past industry on the waterfront. 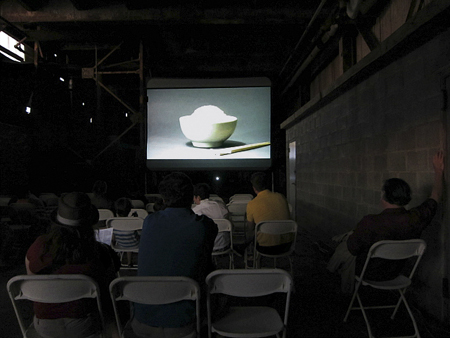 Lumen encouraged a sense of exploration around the space, but there was still a main stage screening room inside one of the factory buildings, which had an hour-long loop of videos by around a dozen artists. As a straightforward video presentation, it was more passive and traditional than the rest of thefestival. I did catch a few videos and especially enjoyed Chee Wang Ng’s mesmerizing “108 Global Rice Bowls,” which showed photographs of bowls of rice from around the world, each presented with a clang. The total number, 108, adds up to the number of beads in a Buddhist rosary. Dancers choreographed by Melissa West, with music by Tom Bones, in “sunsets, recess, gyres” seemed to tirelessly move for the whole evening in front of the endless shoveling of Jeanne Verdoux’s “Man at Work.” Since much of the performance at Lumen was separate from the videos, this pair represented a nice, continued interaction throughout the evening in front of the most towering mound of salt. When my mind was starting to get worn out by the continuous loops of videos, I excitedly joined the crowd around DP Lampman’s “Brain Furniture,” where the artist gave a charming and strange performance in an illuminated box containing three lit, disembodied arms. While accompanied by eerie, music box–like tracks, she acted as a puppeteer and animated the disjointed forms. Getting onto the Staten Island Ferry with its jostle of late-night drinkers heading back to Manhattan was jarring, as I realized how mentally consumed I had been by Lumen, where the alien-like landscape around the broken windows of the old, brick buildings offered a detached peace. Yes, it was just some old abandoned buildings surrounded by road salt, but with the help of well-chosen videos and performances, the factory on the Staten Island waterfront had temporarily become another world. Lumen 2012 took place on June 23 at the Atlantic Salt Company on Staten Island.